Nous avons parlé, dans ce blog, de la possibilité de voir un coup d’état renversant Robert Mugabe, au Zimbabwe. Un des acteurs principaux pouvant être Solomon Mujuru. AllAfrica.com, un site de nouvelles africaines bien connu, vient nous confirmer qu’une telle tentative a été déjouée par le camp Mugabe. We already posted in this blog, the possibility of seeing an attempt of coup d’état against President Mugabe in Zimbabwe. We mentioned Solomon Mujuru as one of the potential protagonists. AllAfrica.com, a well known African news site, just released the news saying a coup d’état was thwarted by the Mugabe camp. Unconfirmed reports say influential retired Zimbabwe Defence Forces commander, General Solomon Mujuru has been placed under house arrest following reports of a foiled coup plot against Robert Mugabe. Accurate information about the country’s military activities is notoriously difficult to find and a highly reliable army source told Newsreel it was too early to put the ‘pieces together’. He confirmed military intelligence officers were following up on the names of some ‘big guns’ believed to be involved in the plot. ‘The problem with Mujuru is that even under house arrest no soldier can stop him from venturing out. The best they could do is put him under surveillance and monitor his phone calls which they might have been doing all along,’ said our source. Another serving officer told us information circulating widely in the army was that Mujuru was placed under house arrest a few days after Major General Engelbert Rugeje and Air Vice Marshall Elson Moyo were picked up after being fingered as the coup leaders. Mujuru still wields vast influence over many military officers who came through Zanu (PF)’s armed wing, ZANLA. Retired army Colonel Bernard Matongo said the implications of the alleged coup plot have left Mugabe in limbo because he has no-one else to trust. Mugabe has always banked on the support of his loyal defence forces to sustain his rule. His party has split into two, with both factions fighting to get rid of him. ‘If reports of the coup plot are true then Mugabe has been left standing alone. The only people he can trust now are his bodyguards, many of whom are his close relatives, otherwise his position as head of state is becoming less secure by the day,’ Matongo said. Reports of the coup plot were suppressed in the country until Thursday when the weekly Financial Gazette carried the story. Some details had first emerged last week when The Zimbabwean and The Zimbabwe Times both published reports of the coup. Sources in the army told us this is the first time since independence that investigations over a coup plot have been carried out in the country. Usually a barrage of denials from the army meets any mention of a coup against Mugabe. First reports of the alleged plot filtered through when a Major Sigauke was reportedly instructed by General Rugeje to put his B squadron of the armoured regiment on standby. Sigauke once served under Rugeje at Inkomo barracks but became suspicious of the order and informed the chief of the defence intelligence, Brigadier Mike Sango. Sango in turn passed on the information to General Constantine Chiwenga, who immediately briefed Mugabe of the plot. Newsreel is also reliably informed that the army’s Presidential Guard, headed by Brigadier Armstrong Gunda and the Special Air Services under the command of Colonel Panga Kufa, were put on high alert following reports of an impending coup. It is not known what role top co-accused Air Vice Marshall Moyo might have played in the alleged plot, but it’s believed almost all pilots in the Airforce of Zimbabwe are loyal to him as the only high ranking officer able to fly an aircraft. After independence Moyo was a flying instructor at Thornhill Airbase in Gweru where he trained the majority of pilots who are senior officers now. Other senior commanders like Air Marshal Perence Shiri and his deputies Air Vice Marshals Henry Muchena and Abu Basutu don’t have flying wings. Meanwhile the UK Daily Telegraph also carried reports of the ‘coup’ Thursday and said that seven serving and former officers of the army have been charged with plotting against Mugabe. The paper said the men were arrested in stages, beginning on May 29, and appeared twice in closed hearings at Harare magistrates’ court earlier this month. A police record of the arrests said that the officers were accused of ‘treason’ over a plot in which they aimed to overthrow Mugabe and install Emmerson Mnangagwa, the rural housing minister, in his place. There are conflicting and different reports about the coup, suggesting that this is all part of the bitter infighting in Zanu (PF) as both factional leaders have been mentioned as being involved. It is known Mujuru and Mnangagwa don’t see eye to eye and that both men are reportedly plotting behind Mugabe’s back to oust him from power. It also seems one camp is now blaming the other for this plot. Voici un article de Tawanda Mutasah (directeur exécutif de l’Open Society Initiative for Southern Africa) qui nous indique que les chefs d’États africains commencent à confronter Mugabe qui semble s’être tirer dans le pied en ayant voulu persécuter l’opposition. Cette dernière, sous l’initiative de la centrale syndicale ZCTU (Zimbabwe Congress of Trades Unions), a déclencher un mouvement de grève générale qui n’a malheureusement pas été suivi partout (lien en anglais). Il faut comprendre que la présence policière a été forte. D’ailleurs, le travail des journalistes devient de plus en plus difficile. The Independent nous annonce même la mort d’Edward Chikombo, un caméraman de la chaîne nationale ZBC, qui a été assassiné. Here is an article by Tawanda Mutasah (executive director of the Open Society Initiative for Southern Africa) who tells us that leaders from African states start confronting Mugabe, which seems to have shot himself in the foot by persecuting the opposition. The opposition, under the initiative of the ZCTU (Zimbabwe Congress of Trades Unions), started a general strike movement that unfortunately wasn’t followed everywhere. But we have to understand that the police presence was strong. The journalists’ work has become difficult and the Independent even tells us that Edward Chikombo, a cameraman for the state broadcaster ZBC, was assassinated. In fact, the sanctions on travel for Mugabe and his henchmen are one form of pressure that has actually been successful. Why should Mugabe be able to “bash” his people – in his own words – and then leave them without electricity and water while he commandeers the national airline to go to London and shop at Harrods? Before the current travel restrictions, he was famous for doing just that. For a decade, Mugabe has shored up his regime by violent suppression of pro-democracy movements at home, coupled with Africanist appeals for legitimacy abroad. But in the aftermath of shocking attacks this month on opposition leaders, his position looks increasingly precarious. It is increasingly unclear whether Mugabe is fully in control in Zimbabwe. The current crackdown defies even the perverted logic of self-preservation. Why would Mugabe shoot himself in the foot by ordering mass arrests of activists and passers-by alike in the vicinity of the Harare headquarters of the opposition Movement for Democratic Change? The arrest of the movement’s leader, Morgan Tsvangirai, and the abduction and torture of prodemocracy organizers have fueled outrage. It is possible that the government has already started to disintegrate, and Mugabe – though he would not admit it – has lost control of the security apparatus of his party, the Zimbabwe African National Union-Patriotic Front, or Zanu-PF. Human rights defenders in Africa worry that Mugabe may continue to hide behind African regional mechanisms while he destroys Zimbabwe. Many leaders in our region have been reluctant to reject Mugabe’s attempts to use his Africanist credentials to shield himself from criticism – as when he questioned the “Africanness” of the African Commission on Human and People’s Rights after it criticized abuses in Zimbabwe. Mugabe and his inner circle have consistently tried to pull the wool over the eyes of their African neighbors, using a combination of diversionary theatrics, and poker-faced lies – such as the 13-page document recently issued to African embassies that claims that Tsvangirai was “at no time” assaulted while in police custody, despite the photographs of his wounds that appeared in newspapers worldwide. In the face of the Mugabe regime’s dissembling, African leaders must be crystal clear in their demands. First, they must insist that Zimbabwe adhere to democratic standards – and the African treaties that Zimbabwe has signed. Second, African leaders must hold Mugabe accountable to an immediate process to end his country’s crisis. This should include, in the year remaining before Zimbabwe’s next presidential elections, a credible road map for a democratic constitution, an immediate restoration of the rule of law, a framework for free and fair elections under international supervision and transitional guarantees of non-partisan control of key state institutions such as the army an the police. African leaders must overcome their reluctance to criticize one of their own. In the face of the disaster in Zimbabwe, we should all be speaking up. La police a bloqué tôt dimanche matin toutes les rues du quartier, fouillé piétons et passagers des véhicules qui y circulaient avant de les obliger à rebrousser chemin. Des escarmouches ont opposé des policiers fortement armés à des partisans de l’opposition. Cet événement est largement repris dans la presse anglophone: l’International Herald Tribune, le Times de Londres. De telles manifestations ne sont pas surprenantes lorsqu’on jette un coup d’oeil au délabrement économique du pays. Le Mail and Guardian d’Afrique du Sud indique que l’inflation dépasse les 1700% et qu’elle risque de passer à 4000%. Le taux de sans-emploi est de 80%. L’arrestation de membres de l’opposition rend aussi la position du président sud-africain Thabo MBeki plus délicate puisque ce dernier a été indulgent envers Mugabe. Ces arrestations soulèvent des protestations en Afrique du Sud où on exige un langage plus dur de la part de Prétoria envers le voisin zimbabwéen. De plus on a appris de la voix de son avocat que Tsvangirai a été passé à tabac par la police pendant sa détention. Vous pouvez lire la section anglaise pour trouver les noms des autres opposants qui ont été arrêtés. Vous pouvez lire Zimpundit , Zimbabwe: Oupost of Tyranny ou New Zimbawe.com pour vous tenir au courant des nouvelles (en anglais). Morgan Tsvangirai est une figure de proue de l’opposition zimbabwéenne. Il créa le MDC en 1999, symbolisant la radicalisation des luttes sociales. Déja à l’époque, l’économie du pays chancelait avec une augmentation de 67% des prix du carburant. Des protestations avaient aussi lieu contre la participation du Zimbabwe dans la guerre au Congo. En quelques mois, Tsvangirai deviendra la plus grande menace politique de Mugabe. Il sera incidemment poursuivi en justice pour “terrorisme”. 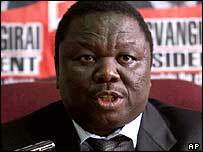 En mars 2002, Tsvangirai perdra aux élections présidentielles avec 42% des voix contre 56% pour Mugabe. Les élections étaient vraisemblablement truquées. Un an plus tard, Tsvangirai et le MDC organisent une grève générale et les événements qui en découleront mèneront à l’emprisonnement de Tsvangirai en juin 2003. 2005 verra la scission du MDC, l’opposition sera scindée en deux avec Tsvangirai d’un côté et Arthur Mutambara de l’autre. C’est une division qui profitera à Mugabe. A civil rights lawyer in the capital, Harare, said at least 35 people had been arrested. The police arrested Morgan Tsvangirai [see picture above] and Arthur Mutambara, who lead rival factions of the Movement for Democratic Change, the only political opposition group of note in Zimbabwe. Among those also reported arrested were Tendai Biti, secretary-general of the MDC; Lovemore Madhuku, chairman of the National Constitutional Assembly (NCA); and Mike Davies, chairman of the Combined Harare Residents’ Association (CHRA). Arthur Mutambara was also arrested. Such protests aren’t surprising if we take a look at the economical situation of Zimbabwe where inflations runs highwer than 1700% and might reach 4000% according to the Mail and Guardian. The unemployment rate is also at 80%. The arrets of opposition leaders makes things more complicated for Thabo Mbeki, president of South Africa. He has alwasy been lenient with Mugabe’s regime. But voices in the country are asking him to take a tougher stance against Zimbabwe. Especially after hearing the news that Tsvangirai was beaten up by the police during his custody. You can read Zimpundit, Zimbawe: Oupost of Tyranny or New Zimbabwe.com to make a follow up of the situation. Morgan Tsvangirai is a leading figure of the zimbabwean opposition. He founded the Movement for Democratic Change (MDC) in 1999. The MDC represented the social struggle of the zimbabwean people. Already in 1999, the population suffered from a faltering economy with gas prices rising by 67%. Protests were also taking place against the involvement of Zimbabwe in the Congolese war. Within monthes, Tsvangirai will become the political Nemesis of Mugabe. Not surprisingly, he will be accused of “terrorist activities”. In March 2002, Tsvangirai will loose the presidential elections with 42% of the votes and Mugabe 56%. The elections were rigged.One year later, Tsvangirai and the MDC will organize a strike. The following events will lead to Tsvangirai’s arrest in June 2003. 2005 will see a split in the MDC. The opposition movement will be lead by Tsvangirai on one side, and Arthur Mutambara on the other. This split will benefit Mugabe’s regime.